County Executive candidate Nancy Floreen has announced that she has been certified for the ballot by the county’s Board of Elections. Following is her press release. GARRETT PARK, MD – Today, the Montgomery County Board of Elections confirmed that Nancy Floreen exceeded the threshold of 7,255 valid signatures needed for her name to appear on the November 6 ballot as an unaffiliated candidate. The Board validated more than 13,000 of the signatures that were submitted earlier this month. With the help of canvassers and volunteers, Floreen collected over 20,000 signatures in just 25 days in her bid to be listed on the ballot. “I want to thank the Board of Elections for being thorough and patient throughout the process. This petition drive was historic. The demand for a more inclusive choice was fueled by more than 20,000 people in less than a month. We’ve unleashed widespread community support. There’s an obvious and clear desire for balanced, non-partisan leadership for the County,” Floreen said. The County Board of Elections July 2018 statistical report showed 652,346 registered voters, 143,420 of which are unaffiliated. With nearly 130,000 votes cast, Marc Elrich won the Democratic primary for County Executive by 77 votes over second-place finisher David Blair. Floreen officially launches her campaign today and will open a campaign office in Rockville. For more information, contact Sarah Van De Weert or visit www.nancyfloreen.com. Council Member Nancy Floreen is claiming that she has obtained 20,343 signatures in her effort to get on the ballot as an independent candidate for Executive. That count far exceeds the 7,255 signatures required for ballot access but the county’s Board of Elections will now go through its verification process. That could take a little while. On August 8, 2016, Robin Ficker submitted roughly 18,000 signatures to get his term limits charter amendment on the ballot. On August 23, the Board of Elections verified 12,573 of them, enough to qualify. So this is not over yet. We reprint Floreen’s statement below. “I am pleased to announce that, in the past 25 days, we have collected 20,343 petition signatures and are submitting them today to the Montgomery County Board of Elections for verification. This should give us a comfortable margin above the 7,255 verified signatures we need to qualify to appear on the ballot as an unaffiliated candidate for County Executive in this year’s general election on November 6th. Hundreds of people from all over the County volunteered to help in this effort, and I am deeply humbled by the outpouring of support we’ve seen. Despite the incredible amount of rain we’ve had over the past couple of weeks, we still prevailed with the help of our dedicated volunteers and canvassers. I really can’t thank them enough. It shows there’s a real desire among voters, one that cuts across all party lines, for a unifying choice for County Executive this fall. People are tired of the extreme partisanship and polarization we see nationally. The last thing we want is more of that at the local level. 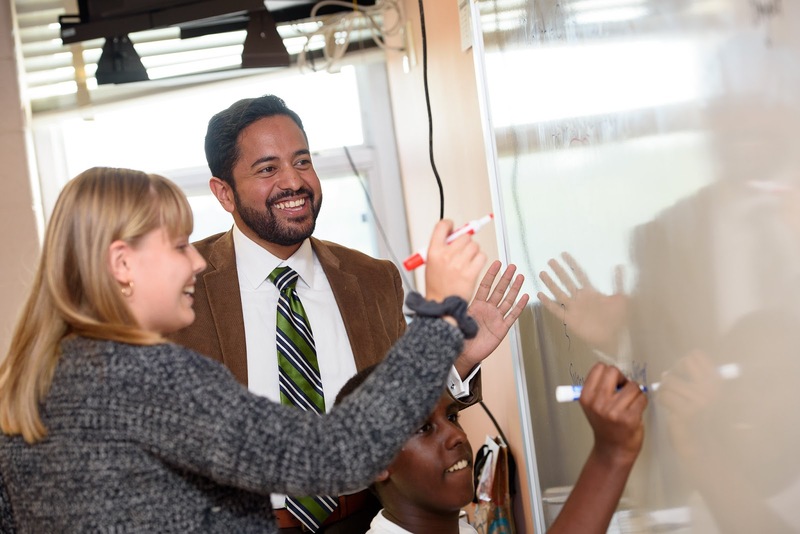 Voters are looking for a broader, more inclusive vision for this County’s future, and for leaders who can unify us around practical solutions, so everyone can feel like they are being represented. That’s the kind of leadership I can offer. Nancy Floreen is completing her fourth term as an At-large Member of the Montgomery Council, where she has served as Council President, chaired the Council’s Transportation and Environment Committee, and helped lead successful County initiatives on economic revitalization, school funding, environmental protection, transportation, affordable housing and smart-growth re-development, among other things. 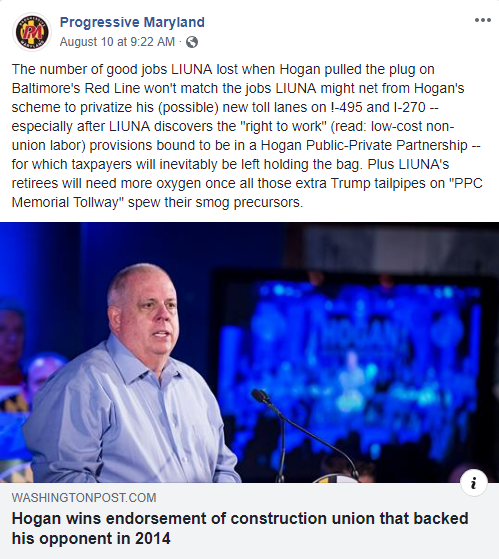 Previously, she served two terms as a member of the Montgomery County Planning Board, in the Civil Division of the US Department of Justice, worked for US Senator Barbara Mikulski, and is a former Mayor of Garrett Park. Nancy has been married to writer/attorney David O. Stewart for 44 years and has three children and two grandchildren. Nancy is a breast cancer survivor and an avid bicyclist having biked through nearly every county in Maryland. Her full bio can be found here. Council Member Nancy Floreen, who is trying to get on the ballot as an independent candidate for County Executive, will be delivering her petition signatures to the Montgomery County Board of Elections today. Following is her press release. GARRETT PARK, MD – Later today, Montgomery County Councilmember Nancy Floreen will deliver signatures collected over the past 27 days to the Montgomery County Board of Elections, as required by law, to be listed on the ballot as an unaffiliated candidate for County Executive in this year’s general election. Why: At least 7,255 valid signatures must be submitted to the Board of Elections by 5:00pm on Monday, August 6, in order to quality to be listed on the ballot as an unaffiliated candidate. Nancy Floreen would like to run for the office of County Executive to offer voters a unifying choice this November. 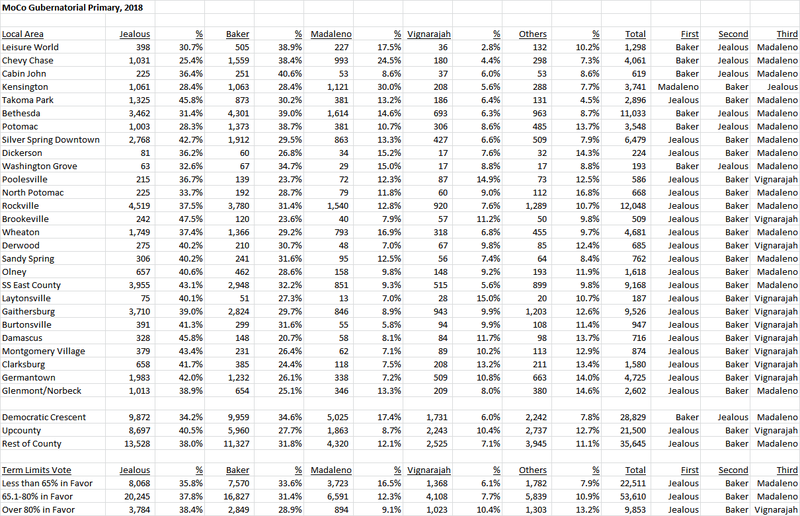 Data Christmas has arrived as precinct results from the primary are now available from the State Board of Elections! We have been busy crunching them and will now begin rolling them out for our beloved readers. 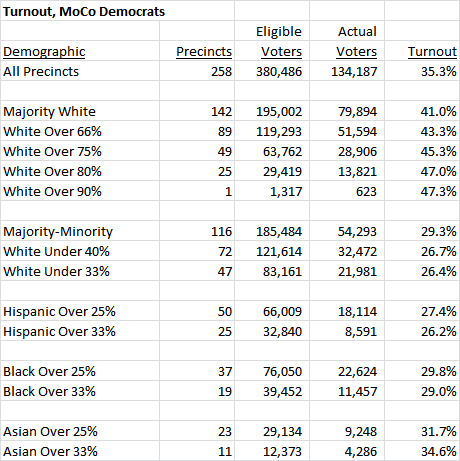 Let’s start today with turnout among MoCo Democrats. 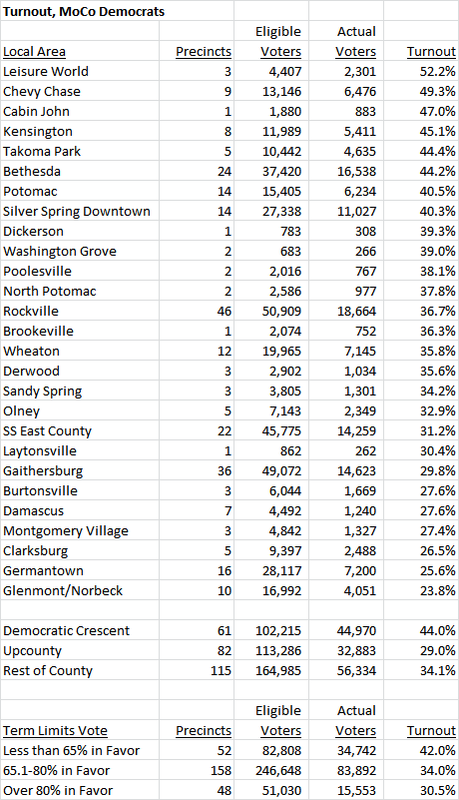 Overall, MoCo Democratic turnout was 35% in the 2018 primary, higher than the state average of 29%. MoCo ranked second to Talbot County among the state’s 24 jurisdictions on this measure. MoCo’s rate of 35% was higher than it was in 2010 and 2014 (26% each time) but lower than 2006 (40%) and 2002 (45%). 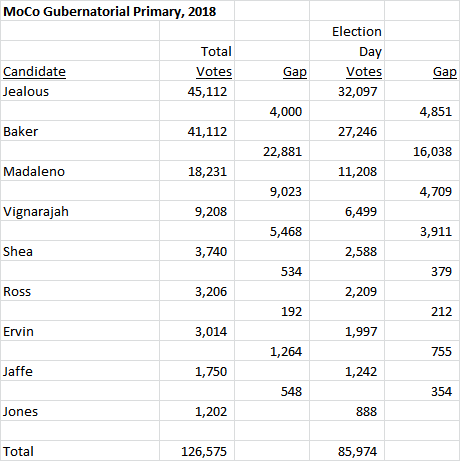 Still, being second in the state after being in the middle of the pack in the last two gubernatorial cycles is a good thing for MoCo. Looking inside the county, there were vast differences in Democratic turnout between local areas. Here are the five highest rates and the five lowest. These differences were reflected in state legislative and council districts. Council District 1 led with 45% while Council District 2 was last with 28%. State Legislative District 16 led with 44% while District 39 was last with 26%. In the Democratic Crescent – the areas inside and near the Beltway that sent Jamie Raskin to Congress – turnout was 44%. 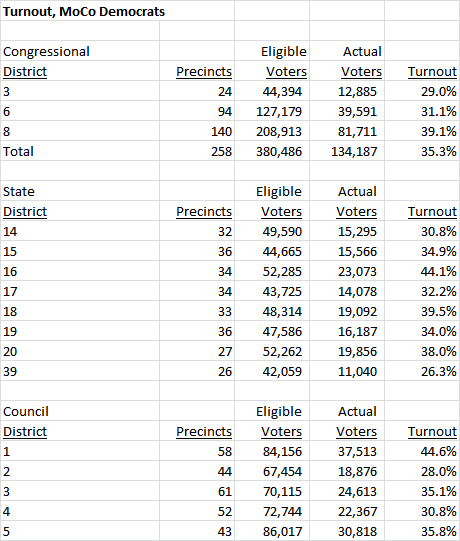 That compares to turnout rates of 29% in Upcounty and 34% in the rest of the county. In precincts where support for term limits in 2016 was less than 65%, turnout was 42%. In precincts where support for term limits was more than 80%, turnout was 31%. This suggests confirmation of a post we wrote before the primary: Democrats who voted for term limits were less likely to vote in the primary. Another factor that stands out is the differences among precincts based on their racial composition. We have been matching precincts to racial data from Census tracts since the 2006 cycle. (We have redone this numerous times since then to accommodate the 2010 Census and shifting precinct borders.) Among majority white precincts, Democratic turnout was 41% and turnout rose as white percentage increased. Among “majority minority” precincts, Democratic turnout was 29% and that rate fell as the white percentage declined. Precincts that were more than 33% Latino had a combined turnout rate of 26%. These patterns of higher turnout in white areas, wealthy areas and the Democratic Crescent and lower turnout in Upcounty, areas with lots of people of color and lower income areas had a powerful impact on the races for Governor, County Executive and County Council At-Large. We will begin looking at those races soon. The Republican Governors Association (RGA) is up with a second TV ad, this one claiming that Democratic nominee Ben Jealous would raise taxes and “would blow a Chesapeake Bay-sized hole in the state budget.” That latter quote comes from a Washington Post editorial opposing Jealous’s proposal to offer free tuition for Marylanders at public colleges. RGA’s campaign, which also includes mail to Democrats, may be early but the risk is that it will define Jealous before Jealous gets to define himself. Yesterday afternoon the Board of Elections concluded their recount of the Primary Election. The outcome did not change. While we ran a dynamic campaign that pushed the status quo . . . at the end we came up 77 votes short. Last night I congratulated Marc Elrich on winning the Democratic nomination for County Executive. I encouraged Marc and offered my support to enhance critical programs such as early childhood education, affordable housing and access to healthcare, as well as pursuing initiatives to foster business growth. Our message clearly resonated with residents all across the County and I will remain engaged to ensure our voices are heard. I also want to thank you again for your support and commitment over the past year. Together we ran an incredible campaign and we generated many innovative ideas to make Montgomery County an even better place to call home. I am proud and humbled by all the support I received and truly grateful for the many new friendships made along the way. While no doubt we are disappointed in the outcome of the election, I suggest to you that this is not the end, but rather just the beginning of our journey together. Looking forward, let’s continue to drive the conversation on the issues that matter most and support Democratic nominees across the state. Again, a heartfelt thank you.